Images of the Soviet Union’s one flight space shuttle, damaged and destroyed by the collapse of the building roof in 2002 where it had been stored. Images of the crushed remains of the Soviet Union’s one flight space shuttle, damaged and destroyed by the collapse of the building roof in 2002 where it had been stored. NASA has chosen the four shuttle engines that will be used to launch SLS on its first mission in 2021. What a waste: NASA has chosen the four shuttle engines that will be used to launch SLS on its first mission in 2021. All four engines were used multiple times on many shuttle missions. They will fly once on SLS, at a cost of many billions, and then end up destroyed when that giant rocket’s first stage falls into the ocean. Worse, no one has really defined what the goal of that first launch will be. It might merely be a test launch, with no humans on board. To me, it would be wiser to put the engines into storage and wait until we have a new reusable capability that could take advantage of the reusable engineering of these engines. Throwing them away on a pork-barrel boondoggle like SLS seems so stupid. Gardner was a astronaut during the early eighties during the heyday of the shuttle’s commercial satellite operation. He was part of the 1984 shuttle mission where he and Joe Allen each flew out to a stranded commercial satellite and took control so that the shuttle’s robot arm could grapple them. Both satellites were brought back to Earth, refurbished, and launched back into space again. 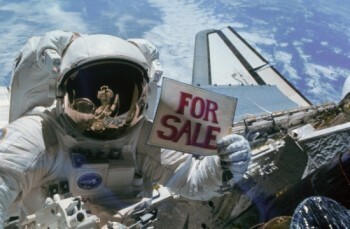 Gardner’s most remembered moment might be when, at the end of his spacewalk, he held up a “For Sale” sign (on right), referring to the commercial availability of both recovered satellites. To get the space shuttle Endeavour to its new home in Los Angeles city officials have decided to cut down about 400 trees along the route. The future dies to exhibit the past: To get the space shuttle Endeavour to its new home in Los Angeles city officials have decided to cut down about 400 trees along the route. Several alternatives for the Oct. 12 move were considered but ultimately discarded. Taking the massive shuttle apart would have damaged the delicate tiles that acted as heat sensors. Airlifting the 170,000-pound craft was also ruled out. Not even heavy-duty helicopters could sustain that kind of weight, Rudolph said. A freeway route was considered until engineers realized that the five-story-tall, 78-foot-wide shuttle could not travel under overpasses. “We had to identify a route that had no permanent infrastructures like buildings and bridges,” Rudolph said. They settled on a final route that will follow Manchester Boulevard to Crenshaw Drive, then onto Crenshaw Boulevard and Martin Luther King Jr. Boulevard — wide thoroughfares with few permanent obstacles. To make way for the shuttle, some trees will be pruned, power lines will be raised and traffic signals will be removed. Inglewood will lose 128 trees, and communities in South Los Angeles about 265 trees, though the exact number has not yet been determined. Normally I wouldn’t sweat over the removal of some trees, but this is quite disgusting. It once again raises questions about the choice of Los Angeles over Houston for a shuttle. Vultures fighting over a corpse: Texas Congressmen are trying again to grab the shuttle from New York. Surviving the end of the shuttle problem: how some private companies are doing it. Closeout of the shuttle program is an enormous effort expected to take two years. The program occupied 640 facilities and used more than 900,000 pieces of equipment with a value exceeding $12 billion, according to NASA. Much of the work will take place at Kennedy Space Center, where orbiters have been maintained and prepared for launch. NASA requested $89 million for shuttle transition and retirement work in the 2012 fiscal year that begins Oct. 1, but Congress has not yet approved a budget. The shuttle Atlantis has landed, ending the shuttle program. Worth reading: Nature has put together a special section of articles on the history of the space shuttle. The space shuttle has undocked from the space station for the last time. That’s so nice of them: Russia vows not to exploit its manned space flight monopoly. Actually, this isn’t really news. Since the fall of the Soviet Union the Russians have always driven a hard bargain when they have sold tickets to get crew or cargo into space. However, once the contract has been signed they have also honored those contracts, to the letter. As the U.S. already has a signed contract to get its astronauts to ISS using Russian rockets and capsules, there won’t be any opportunities for Russian exploitation — until that contract expires. In other words, the U.S. had better get some manned launch capability on line before too long. And on that note, see this article: NASA considers man-rating the Atlas V.
The shuttle mission has been extended one day. The space shuttle docks with ISS, for the last time. After a very short hold at 31 seconds, the space shuttle Atlantis has launched and reached orbit without any obvious hitches. Clark Lindsey has provided a list of websites where you can watch the shuttle launch live from your computer. Also, Bill Harwood is updating his reports very regularly. Hubble makes its one millionth science observation. Going to see the shuttle launch on Friday? The Space Walk of Fame Foundation Museum in Titusville, Florida needs volunteers to help organize the launch viewing at places like Space View Park. A photo tour of Launch Complex 37B, level by level. The history of the space shuttle in photos. Hat tip Clark Lindsey. Seems a bit long to me: NASA foresees a two year period after the last shuttle lands to retire the program completely. Some advice on how to watch the last shuttle launch. Better buy that ticket now if you want to see the last shuttle launch from the best spot: Online prices have soared for space shuttle Atlantis launch tickets. NASA is about to decide on its shuttle heavy-lift replacement, and it looks like it will be almost entirely shuttle-derived. As I have said previously, this rocket will almost certainly never fly. NASA has to start over after spending billions and years developing Constellation, and is being given less money and time to do it. And even if I am wrong and this rocket does fly, I bet it will do only one flight and then be retired as too costly. During a tanking test of the space shuttle Atlantis today a valve to the main engines leaked, requiring replacement and raising questions whether the July 8 launch date can be met. The pork goes on: The shuttle’s end has still left NASA with a half billion dollar pension bill. A camera has been installed on the last shuttle external tank so that its destruction in the atmosphere can be observed. There was a small fire in Endeavour’s landing gear when it landed last week. NASA has finally released the photos of Endeavour docked to ISS, taken from a departing Soyuz.